If you have noticed toner flaking off of your copies or prints, it can pose a real problem. If you have noticed toner flaking off of your copies or prints, it can pose a real problem. This can take its toll on important documents. If you are looking for more high-quality results from your printer, read on to discover how easy and convenient it can be to fix it. How Does Your Copier Work? Your copier works by making use of heat to fuse toner to the paper. This amount of heat can vary widely depending upon the thickness of the paper you use. What Causes Toner to Flake Off? If you notice toner flaking off your paper this is most likely because you are using a heavier stock of paper. This happens because heavier paper requires more heat in order to fuse the toner to the page. Copiers can’t automatically sense the type of paper that’s used. It also can’t sense the thickness of paper and assumes it’s all the same thickness. 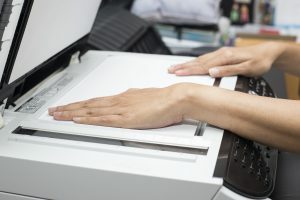 It uses the same amount of pressure on all types of paper as a default, which can lead to issues if you don’t plan ahead and set your copier and printer correctly. How Do You Fix Toner Flaking? It is important to set your printer properly in order to let it know what thickness of paper you are using. This will help you avoid toner flaking. In order to do this, first open your printer properties panel. Then click the paper tab and select your tray. Under paper type, select Heavy Paper 1 for anything thicker than 28 lb, or Heavy Paper 2 for anything thicker than 90 lb. How Do You Change the Settings on Your Copier? Open your copier’s tray settings. Then you will need to select the tray you are printing to. Select your paper type and you will be ready to go. This entry was posted on Friday, May 19th, 2017	at 3:00 pm	and is filed under Fixing problems	. You can follow any responses to this entry through the RSS 2.0	feed. Both comments and pings are currently closed.